We value the contributions of our people. Their dedication determines the strength of our operations, and our reputation for excellence. 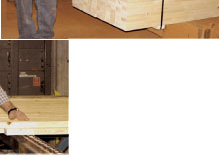 We emphasize quality over recovery in all of our processes. And we invest in appropriate levels of technology to ensure that you receive 'premium' fingerjoint studs. This approach also provides a secure foundation for our employees, now and into the future. We understand that every substandard stud costs you time and money. And potentially, your reputation. That is why we manufacture our fingerjoint studs to exacting standards, engineered for superior performance. Our goal is total customer satisfaction. Our business is to help you succeed in yours.